It’s hard not to be impressed when you first step into ATLAS. 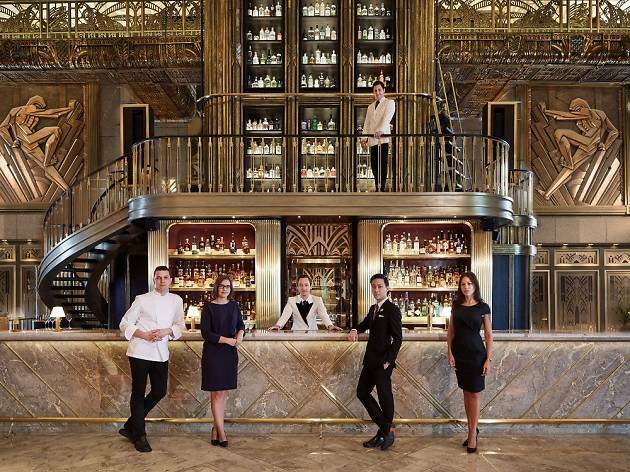 The grand art deco-inspired bar looks exactly like a European hotel lobby of the era. Magnificent champagne-hued tapestries line the ceiling, intricate gold and bronze balconies surround the space, and, of course, a massive gin tower stands imposingly at one end. Said to house over 1,000 bottles of gin, ATLAS has the most diverse collection of the spirit in the world. With so much to choose from, it’s easy to feel overwhelmed so let Master of Gin, Jason Williams, and his team help. Simply tell them the types of gin you enjoy (or the flavour profile of drinks you prefer) and they'll make a suitable recommendation. Alternatively, stick to the Classic G&T ($19), a goblet of London gin, housemade tonic and fresh citrus. For something a little stronger, go for The ATLAS Martini ($24), a blend of gin, Ambrato vermouth, orange bitters, champagne vinegar and pomelo. 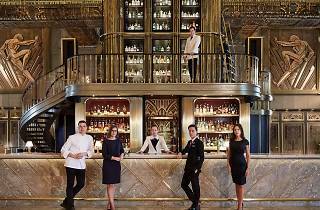 It’s not all gin on the menu, though, try some cocktails prepared by head bartender Roman Foltán who harks from London’s award-winning Artesian at The Langham, or head to the bar's bespoke walk-in Champagne Room for some of the world’s finest bubbly. Chef Daniele Sperindio (formerly from Open Farm Community) is in charge of the kitchen, and it shows. Dishes like the topinambur risotto ($24) have his name written all over it. The light, vegetable-based risotto is creamy yet complex, with pickled pearl onions and Jerusalem artichoke tuile for crunch. But most of what I tried, sadly, left more to be desired. The canvas of pasta ($30) is merely a bolognese base topped with a sheet of pasta and three slivers of wagyu, while the spicy chorizo sandwich ($24) in no way justifies its price tag. Unless more tweaks are made to food, I’ll be sticking to the drinks the next time I’m here.